Is there any future for the desktop PC? This was the future. Once. A 19-inch flat CRT. DVD decoding. And hardware-accelerated 3D graphics. That was my brand new PC circa 2000 and to this day it remains the single most exciting computer I ever owned. It was a revelation. Somehow I knew in bones this is what desktop computing was suppsed to be like. Since then, not that much has changed. Yes, really. 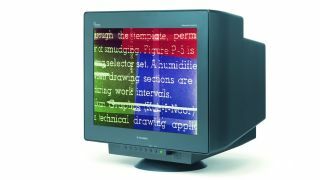 That old Pentium III-powered MESH PC introduced me to large, high resolution displays, quality video playback and happened to coincide with the web transitioning from niche curiosity to a basic human right. OK, one or two other important waypoints have punctuated my computing journey. I can remember very clearly the first time I saw 3D graphics rendered with blended textures (Tomb Raider on a TNT 2, if you're asking). The transition to LCD and from hard drives to SSDs were major epiphanies, too. Likewise, my first vaguely thin and light laptop (Dell Inspiron 4000, what a peach that was!) holds fond memories, as does my first smartphone with a capacitive screen. An iPhone 3G may seem predictable. But after the humanitarian disaster that was the resistive (quite literally) LG Viewty, you can hardly blame me for playing it safe. Somehow, though, none of those can compete in my consciousness with that old MESH desktop and its Diamondtron CRT tube. Part of that, I'm happy to admit is generational. Had I been born earlier or later, I'd no doubt have a different view. But there's more to it than that. Little of true gravity has changed in my day-to-day computing experience, at least if we're talking tethered PCs. Among office-bound Brits, which is an awful lot of us, things have been pretty incremental over the past decade. All of which has me pondering two things. Firstly, it would be great to hear what were your most memorable computing epiphanies. Secondly – and most critically – what's next and has it already arrived? Obvious candidates are ultra mobile computing, touch and cloud computing, the latter including social networking. They're all biggies. But the first two have yet to usurp my MESH PC for serious content creation. And the last, you could argue, is just a subset of what was already happening in 2000, ie the rapid rise of the internet. I suppose what I'm really asking is what's the next major paradigm for desktop – or perhaps more accurately mainstream daily - computing? Will it be a new interface? As I sit here with my traditional keyboard and mouse, I can't quite grasp what will replace ye olde rodent and pecking stick. They remain by far the most efficient tools for mainstream content creation. I don't buy into touch for desktop computing, so maybe some kind of context-aware interface augmentation is the next step. The result might be a machine that works with you much more symbiotically and makes a mouse feel clunky. You used to point at things? You computer didn't instinctively know what you wanted to do next? Sheesh. Then there's the internet and social networking. That it's having a dramatic effect on the way people live already is beyond obvious. But for early adopters who used apps like instant message clients back in the late 90s, even Facebook with bells and whistles might be seen as a question of scale rather than a new paradigm. After all, IM clients were effectively broadcasting status updates to a social network before the term even gained traction in venture capital prospectuses. Then again, maybe scale or quality is what actually matters. In which case, the tipping point for a slightly younger generation might be the transition of Facebook from a closed shop for students to a truly global organism and the realisation that social networking isn't just for fun, it's for life. Let's be honest, this is a huge and diffuse subject I'm grappling with here. But if the context is the PC, my central point is how remarkably resilient the conventional PC is proving, especially if you allow traditional laptops as part of the mix. I'm happy to do that since many people use laptops much as they did desktops of old. They're often just smaller, more discrete desktops that rarely if ever leave the home. Sure, the PC is essentially flatlining as an industry. In the western world, refreshing the installed base rather than actual sales growth is where we're at. But that's very different from saying PCs are about to disappear. So, here's my plan. If I'm still ticking in this business when another decade has passed, I'm going to dredge up this time capsule. When that happens, I think there will still be something recognisable as the PC on sale and in broad use. And there's a good chance I'll pen that piece on it. What do you think?